Neil deGrasse Tyson's number-one New York Times best-selling guide to the cosmos, adapted for young listeners. From the basics of physics to big questions about the nature of space and time, celebrated astrophysicist and science communicator Neil deGrasse Tyson breaks down the mysteries of the cosmos into bite-sized pieces. 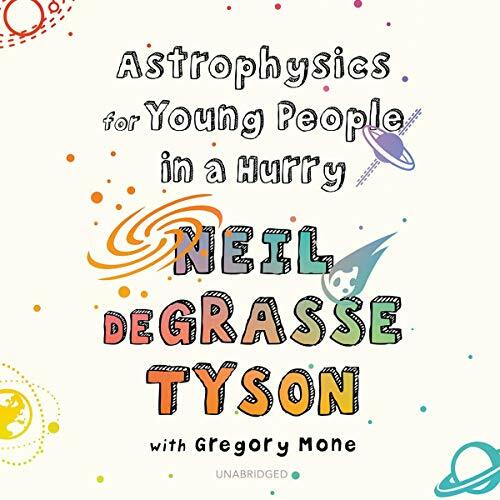 Astrophysics for Young People in a Hurry describes the fundamental rules and unknowns of our universe clearly - and with Tyson's characteristic wit, there's a lot of fun thrown in, too. ©2019 Neil deGrasse Tyson and Gregoy Mone (P)2019 Blackstone Audio, Inc.
Narrator, a voice you trust, educates, and entertains. An author who is so clever with his words, you forget you are hearing an educational book. This book is a win for parents and a win for young folks. I really liked the book. Easy to follow. The narrator was soothing to listen too.